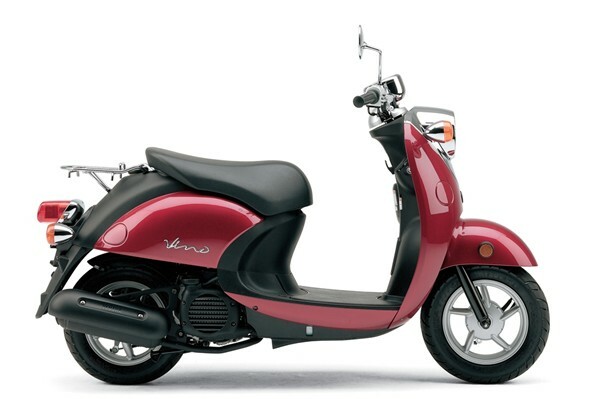 The stylish 2008 Yamaha Vino Classic offers clean, quiet, fuel efficient 4-stroke performance. The easy to ride Vino makes more sense than ever as gas prices continue to spiral upwards. Automatic transmission, and locking under seat storage make the Vino a sensible fun loving alternative form of transport. The four-stroke Vino Classic – the result is hugely functional, reliable and economical transportation that also happens to be just plain fun. 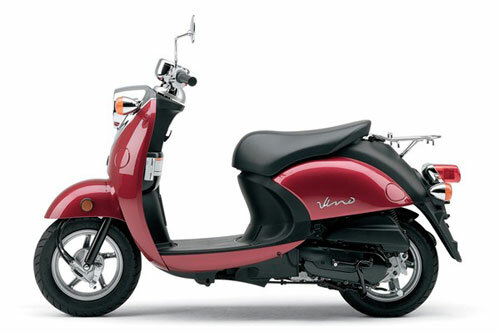 The fashionable and fun loving Vino sports a clean, quiet, fuel efficient 4-stroke engine. The gas sipping Vino is ready to zip you around town with its environmentally friendly 49cc, 4-stroke powerplant. Whether you are looking for a fun, affordable way to commute or just looking to make a personal statement, the stylish Vino 50 may be the solution. Gas and go convenience meets European styling in the easy to ride, easy to own Vino. *Disclaimer for all Canadian models: fuel consumption figures based on 40km/hr speed on level ground. Peppy, 49cc, liquid-cooled (with fan assist), SOHC, 3-valve, 4-stroke engine puts out lively, predictable power with incredible gas mileage. The design concept of this engine is peppy performance with low noise, low emissions, and low fuel consumption. Easy, dependable electric starting with backup kick starter. The cylinder features a ceramic composite coating which insures uniform heat dissipation, reduced friction and an extended service life. Three valve cylinder head design utilizes two intake valves (15.5mm) and one exhaust valve (16.5mm). The dual intake valves allow more fuel and oxygen to enter the engine for increased power output. Valve adjustment is via easy access shims. Special “carbon cutter” valve design removes any carbon build-up on the valve stem to keep the engine operating at maximum efficiency, especially when the unit is being ridden at slow speed for prolonged periods of time. Roller rocker arms are used to actuate the valves. The roller rockers reduce friction and mechanical noise to a minimum for a quiet, enjoyable ride. Liquid-cooling with fan assist is used to maintain stable engine temperatures even during stop and go city riding. Liquid-cooling allows for a higher state of tune for increased engine performance. The radiator is positioned longiitually in the frame next to the engine. Crankcase sump-type oil delivery system is utilized. A special centrifugal oil filtering system is used. This type of oil filter automatically removes any particles found in the oil and never requires cleaning or maintenance. 18mm carburetor features a throttle position sensor (TPS) that is linked to the ignition system to provide crisp throttle response. The TPS system monitors the throttle opening and sends the info to the CDI to provide the optimum ignition timing for great performance. Other TPS benefits include increased fuel economy and reduced emissions. Easy access, paper-type air filter is used. Total air box capacity is 2.0 liters for excellent performance and reduced intake noise. Automatic choke means no choke to fuss with and makes cold starting a snap. Fully automatic, V-belt centrifugal transmission ensures easy, twist-the-throttle-and-go operation. There is no clutch or gear shifting to worry about. A wide range reduction ratio is used for peppy performance. Maintenance-free CDI system with 2-D mapping provides a precise, high-voltage spark for fast starts and crisp engine performance at all rpms. Air induction system (AIS) is used to reduce harmful exhaust emissions. The AIS system injects oxygen into the exhaust port area to ensure complete fuel combustion, thereby reducing both hydrocarbon (HC) and carbon monoxide (CO) emissions. Exhaust system and muffler produce a very quiet environmentally friendly exhaust note. The muffler features a catalytic coating to further reduce harmful exhaust emissions. 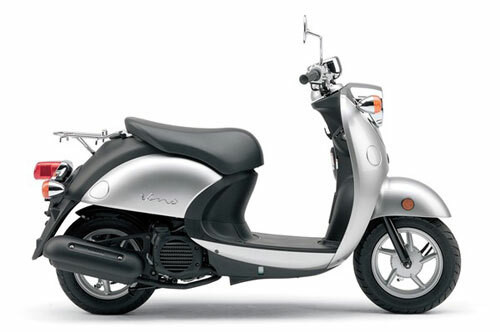 Rugged, step-through, underbone-style, steel-tube frame design provides stable, predictable handling. The step-through design means it is very easy to get on and off the Vino. Telescopic front fork provides a comfortable around town ride. Single-shock rear suspension provides a plush, comfortable ride. Front and rear 110mm drum brakes supply strong, reliable stopping power. They are hand operated, for ease of use …. just like on a bicycle ! Rugged yet lightweight, die cast aluminum 5-spoke mag style wheels are fitted with 10″ tubeless tires. 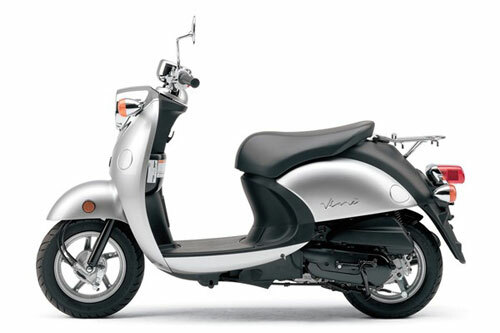 Comfortable, saddle-type, single seat ensures excellent rider comfort and unmistakable style. Large 4.5 liter fuel tank means lots and lots of kilometers between fill-ups. Locking fuel cap provides peace of mind. 35/35-watt multi-cut lens headlight maximizes nighttime visibility and enhances retro styling. The headlight and turn signals are chromed for an added styling highlight. Full-size floorboards and wide, stylish front apron provide excellent splash and wind protection and highlights that retro European styling. Eye catching, chromed speedometer assembly features an integrated electric fuel gauge. Large size digits are very easy to read. Other functions include high beam indicator light, turn signal indicator lights and coolant temperature warning light. Unique “G-Lock” anti-theft rear wheel locking system. There is a small lever beside the ignition switch that when moved to the lock position, not only prevents the rear wheel from turning but also slides a cover over the key portion of the ignition switch. It is similar to shifting the transmission on an automatic car into park. Rugged chromed rear rack adds additional carrying capacity. Maximum capacity is 3 kgs. Electronic fuel gauge lets rider keep track of fuel level. Push-to-cancel-type turn signals enhance ease of use.